Before rewiring any ceiling fan, turn off electrical current at source by switching off circuit breakers. WARNING: Failure to disconnect power supply to ceiling fan may result in serious injury or death. Detach switch housing or light kit from the ceiling fan and disconnect the kit wires. Unscrew the switch nut fastened to the current fan switch. Lower the fan switch and attached wires cautiously from the switch housing. Check wires and make sure to observe and write down which color wire from the fan is connected to which wire on fan switch (1, 2, 3, L). Carefully cut the four wires from the existing fan switch using wire stripper and set it away. Strip wires around 1/2 inch. Connect the Black wire (L) from the new fan switch to wire from the fan you noted. Connect the red wire (1) from the new fan switch to wire from the fan you noted. Connect the Blue wire (2) from the new fan switch to wire from the fan you noted. Connect the White wire (3) from the new fan switch to wire from the fan you noted. Secure connection between the wires using wire connectors by twisting them clockwise (CAUTION: Connection of wires must be tested and verified, otherwise it may result in fire hazard, electrical shock or serious injuries). Remove nut from the new switch, feed the threaded part of the new switch through the specified hole in light kit, then secure the switch with the nut. Re-wire the light kit and re-attach it to the fan. Connect power to the ceiling fan and test the new switch. Click here to purchase this Zing Ear ZE-208s E89885 fan switch. What is the model number of the old switch? Can you please tell us what is the make and model number of the old switch? Please help! My chain broke on my ceiling fan switch! It broke within the switch so it will have to be replaced. Problem is that my 4 wire colors do not match what is advertised. On one side of the switch they are orange and black. On the other side they are yellow and blue. Any recommendations as to what to do and a replacement switch and schematic for matching wires up? Switch is Zing-Ear ZE-208S. Is your old switch also ZE-208s? to what terminal number was the black wire attached? My switch is ZE-208S. Color of wires are orange/black/yellow and blue. Don’t know which terminal the black wire was connected to . Fan was in office work area so I was limited for time and had to reassemble. – Unscrew the switch nut fastened to the current fan switch. – Lower the fan switch and attached wires cautiously from the switch housing. 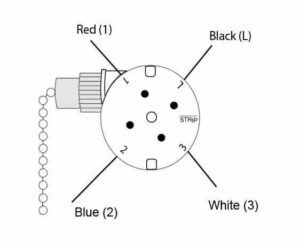 – Check wires and make sure to write down which color wire from the fan is connected to which wire on fan switch (1, 2, 3, L). Switch type to replace broken one, indicating wire colouring. What do you do with the white wire from the cord to the fan. This is a floor fan on a pedestal. There is a red wire a black wire and a white wire. Where do they go?